Pro Tour Kaledesh is approaching and a new metagame is upon us, but just how much of it is solved? Are RW Vehicle/Aggro decks the ones to beat? Will they be the new Collected Company? I tend to disagree with that assumption . Sure Smuggler’s Copter has shaped the first two weeks of Kaladesh standard, but you can be sure there will be new players come next weekend. The question is, just how many of those cards will be from Kaladesh and how many will be previously underplayed cards from the other sets in standard? That’s what I plan to look at today as always: potential. Archangel Avacyn – Miss. There hasn’t been a bump yet and there could still be one after the Pro Tour, but I don’t think she’ll be as popular without Collected Company and GW tokens playing her. Down to $18 from 20. Eldrazi Displacer – HIT. Thanks to cards like the new Gearhulks and other fun cards like Panharmonicon, Eldrazi Displacer should find plenty of takers in this new meta. Up to $5 from $4.50. Hanweir Militia Captain – Miss. It was my longshot pick, and I knew it wouldn’t perform well. I still like it in my RW tokens deck though. 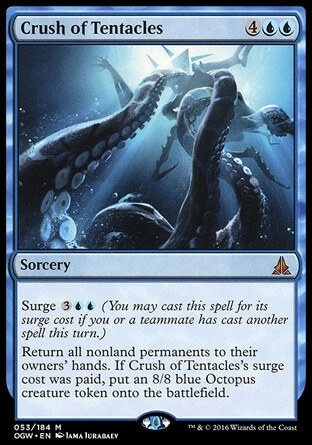 Crush of Tentacles – HIT. I felt like it would be playable in the new cycle and others seem to agree. It’s currently just over $3, which means its value has doubled since my last article. Drana, Liberator of Malakir – Miss. No love for Drana. She continues to see little if no play, and with 3/3 flyers now ruling the air she might find it hard to dominate the skies in this new meta. Down to $4.50 from 6. Mindwrack Demon – Miss. This is another card that I think will break out this standard, but hasn’t done so yet. It’s down to about $2 from $2.50, but shouldn’t stay there for long since it’s so good against Copters and Spirits. Ruinous Path – HIT. It was one of my penny stock picks from last time and it’s inched up slightly to $1.75 from $1.50. Might go up a little more. I did alright, but for the most part there weren’t any big movers. That’s what I get for writing my articles BEFORE the Pro Tour. If I were to wait until afterwards though there would be no meaning on buying a lot of the cards I’m thinking about because they’ll pretty much be decided a week from now. I could still be right about some of the cards I missed since last time, so be sure to check back next Monday to see if I was right after all. My first pick for the new format is Declaration in Stone. I feel like exiling effects will be much stronger than burn or kill effects in this standard due to cards like Verdurous Gearhulk in GW decks, Emrakul/Ulamog in Aetherworks Marvel decks, and aggro decks that tend to flood the board with same named cards in order to swarm you. I don’t think it will hit it’s previous high of $10+, but I could see it going from $4.50 towards $6 or so over the next month. With GW and RW doing well currently, and many other white based decks probably using him, I’m going to be bullish on Gideon and say he’ll see a spike during Kaladesh standard from his current value of $20 to about $25. It could go higher, but I think right now is probably the best time to get him somewhat cheap. 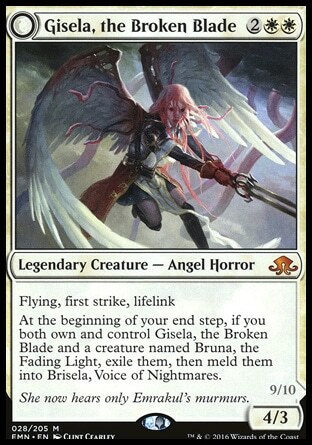 Gisela seems like a good answer to Copter decks, especially if you’re running the green Gearhulk and can pump her up the following turn. I don’t know how much of Bruna we’ll see, but I expect white midrange decks to play at least 3 of her, so I won’t be surprised to see her regain some of her lost value and hit double digits again. She’s at $9.25 now, but I could see $11-$12 in her future. I’m not sure where Thalia will fit in (perhaps GW Gearhulk? 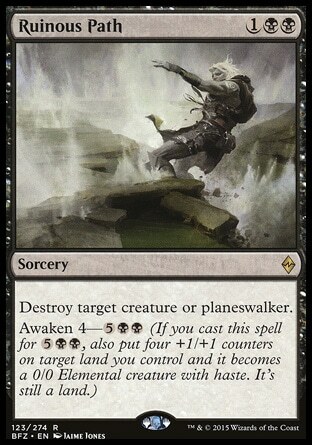 ), but seems like a good card when playing against RW Vehicles. Not only does she tap in all of the creatures that would crew an opponent’s vehicles, but she also does well on both offense and defense. She’ll be able to stop a Fleetwheel Cruiser or attack into a Smuggler’s Copter without worry. 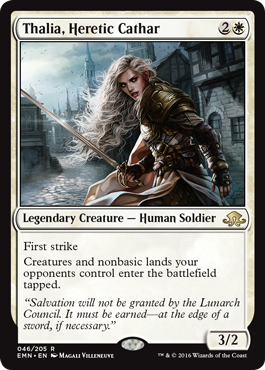 Her spot could be in the mainboard of some white decks or in the sideboard, but I don’t think she’ll be too widespread. At $3.35, I think she could see a slight bump if she shows up, but not much. I don’t expect her to hit more than $5 over winter vacation. $4 will probably be closer. There has been talk about Descend upon the Sinful ($1.10) seeing more play in sideboards as an answer to Avacyn backed decks or those that have cards which can’t be killed easily, so I wouldn’t be surprised to see the card double to around $2.25 as a strong SB option. Quarantine Field ($1) is another card that can finally see more play now that Dromoka’s Command is gone. There will still be a solid amount of enchantment/artifact removal in this format to deal with Copter, but I don’t think the decks that would use Field would side it in against you. Card could easily double up if it starts appearing in more sideboards. Stone Haven Artificer works really well with the new equipment that attaches itself automatically to artificers, and while I don’t think it will be part of a Tier 1 deck, I could see the strategy sneaking into Tier 2 status. At $.50 it’s not a huge loss if it turns out to not become popular, but you stand to gain a lot if we get more good equipment in Aether Revolt and this Artificer goes up to $2-3 as a 4 of in an equipment deck. At almost $3.25, I think Crush has a little bit more space to move upwards, especially if it shows up as a 4 of in a control deck. This is mostly because it’s a mythic rare. I could see the card showing up in a Storm type deck using Aether Reservoir, and also showing up alongside Part the Waterveil in those UG decks that showed up here and there in the last standard meta. $4 to $4.50 seems closer to it’s real value. Mausoleum Wanderer ($1.35) has a lot to gain from UW spirits doing well, but it’s going to depend on if that deck can deal with Smuggler’s Copter cause most of the spirits are 2/3s which aren’t going to help. Perhaps if UW spirits becomes an Always Watching deck? It’s a longshot, but could go up again. Rattlechains ($1.50) is in pretty much the same boat. Their fate is tied together and both prices could double or triple if the deck does well. 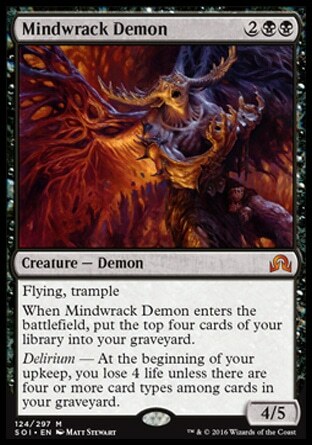 I’m going to remain bullish on Mindwrack Demon ($2). It’s relatively cheap to play, and GB Delrium decks have proven to be do well. It will depend on how much of a problem Smuggler’s Copter ends up being against them, and if people start running 4 copies of this card in their delirium decks then you can be sure the card will hit $5 overnight. I believe its value will be closer to that come January. Now that we have Murder Path won’t be as necessary in the main deck, but I think you can be damn sure it will be show up as at least a 2 of in the sideboard of black decks and maybe even had 1-2 in mainboards. Black control decks such as UB, Esper, and BW will be using it, so I think the card could see a small spike in the coming months. 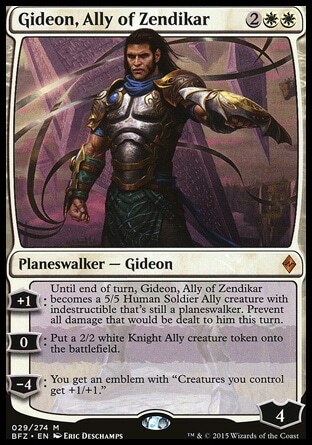 Gideon is an absolute pain, as it Liliana and Tamiyo. My guess is $3 by the next set, up about $1.25 from its current price. Cryptbreaker ($1.50) has been showing up in a few UB zombie decks like the emerge one, but I’ve also seen it show up in a UB Zombie/Copter deck. I think it will finally see some standard play this cycle and that will push its price up a little. I kind of like Voldaren Pariah ($1.50) as well, though I don’t think there is a good tokens deck yet that can use her well. Seems like a great card alongside Cryptbreaker and Prized Amalgam. Discarding it turn 3 to make a zombie token, with another zombie in play, tapping to get a card, then sacrificing them to semi-wipe an opponent’s board and get a 6/5 is huge. Lots of potential there. In past sets we’ve sometimes had no new cards that really changed the metagame, but with the last few sets we’ve seen a lot of cards from the new sets find homes right away. This is a stark contrast from Gatewatch and BFZ standard where there was little to no change and people continued to play the same decks from the standard before it. Kaladesh cards make a lot of these previous cards better, but they also are good enough to play by themselves in any deck you want like Smuggler’s Copter and Verdurous Gearhulk. I expect there will be a few more cards showing up this weekend at the Pro Tour that many of us totally forgot about. I’ll be back in a few days for the next batch of colors (red, green, and artifact), so be sure to stop by then to see what’s up. Until then, I hope your brewing is going well and that you’re enjoying the new metagame. See you next time.